Proprietary Name: Rocklatan What is the Proprietary Name? Non-Proprietary Name: Netarsudil And Latanoprost Ophthalmic Solution, 0.02%/0.005% What is the Non-Proprietary Name? 70727 - Aerie Pharmaceuticals, Inc.
Rocklatan with NDC 70727-529 is a a human prescription drug product labeled by Aerie Pharmaceuticals, Inc.. The generic name of Rocklatan is netarsudil and latanoprost ophthalmic solution, 0.02%/0.005%. The product's dosage form is solution/ drops and is administered via ophthalmic; topical form. Labeler Name: Aerie Pharmaceuticals, Inc. Dosage Form: Solution/ Drops - A solution which is usually administered in a drop-wise fashion. Ophthalmic - Administration to the external eye. FDA Application Number: NDA208259 What is the FDA Application Number? Start Marketing Date: 03-12-2019 What is the Start Marketing Date? The recommended dosage is one drop in the affected eye(s) once daily in the evening. If one dose is missed, treatment should continue with the next dose in the evening. 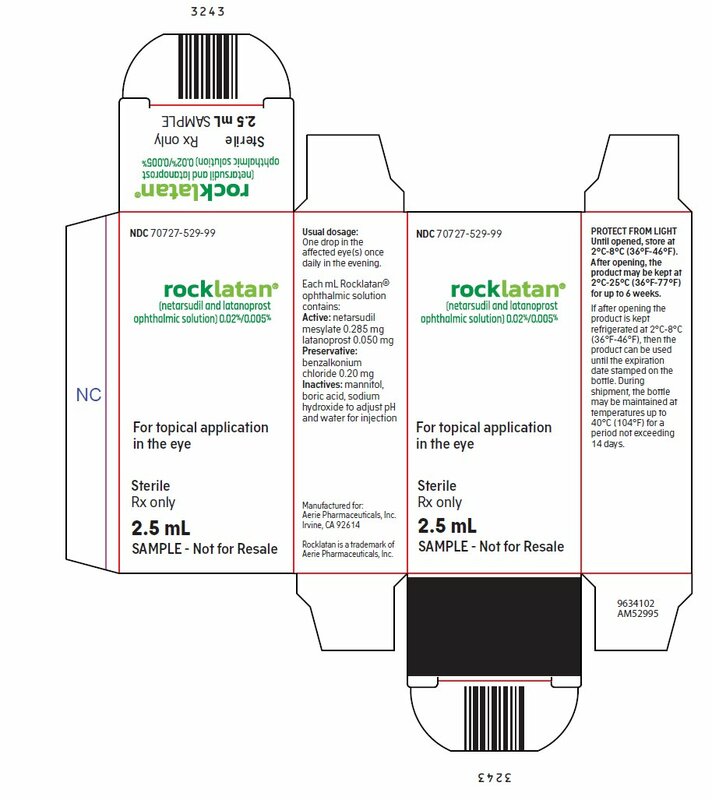 The dosage of ROCKLATAN should not exceed once daily.ROCKLATAN may be used concomitantly with other topical ophthalmic drug products to lower IOP. If more than one topical ophthalmic drug is being used, the drugs should be administered at least five (5) minutes apart. ROCKLATAN contains latanoprost which has been reported to cause changes to pigmented tissues. The most frequently reported changes have been increased pigmentation of the iris, periorbital tissue (eyelid), and eyelashes. Pigmentation is expected to increase as long as latanoprost is administered.The pigmentation change is due to increased melanin content in the melanocytes rather than to an increase in the number of melanocytes. After discontinuation of latanoprost, pigmentation of the iris is likely to be permanent, while pigmentation of the periorbital tissue and eyelash changes have been reported to be reversible in some patients. Patients who receive treatment should be informed of the possibility of increased pigmentation. Beyond 5 years the effects of increased pigmentation are not known.Iris color change may not be noticeable for several months to years. Typically, the brown pigmentation around the pupil spreads concentrically towards the periphery of the iris and the entire iris or parts of the iris become more brownish. Neither nevi nor freckles of the iris appear to be affected by treatment. While treatment with ROCKLATAN can be continued in patients who develop noticeably increased iris pigmentation, these patients should be examined regularly [see Patient Counseling Information (17)]. Because clinical studies are conducted under widely varying conditions, adverse reaction rates observed in the clinical studies of a drug cannot be directly compared to rates in the clinical trials of another drug and may not reflect the rates observed in clinical practice.The most common ocular adverse reaction observed in controlled clinical studies with ROCKLATAN was conjunctival hyperemia which was reported in 59% of patients. Five percent of patients discontinued therapy due to conjunctival hyperemia. Other common ocular adverse reactions reported were: instillation site pain (20%), corneal verticillata (15%), and conjunctival hemorrhage (11%). Eye pruritus, visual acuity reduced, increased lacrimation, instillation site discomfort, and blurred vision were reported in 5-8% of patients.Other adverse reactions that have been reported with the individual components and not listed above include: •Netarsudil 0.02%Instillation site erythema, corneal staining, increased lacrimation, and erythema of eyelid. •Latanoprost 0.005%Foreign body sensation, punctate keratitis, burning and stinging, itching, increased pigmentation of the iris, excessive tearing, eyelid discomfort, dry eye, eye pain, eyelid margin crusting, erythema of the eyelid, upper respiratory tract infection/nasopharyngitis/influenza, photophobia, eyelid edema, myalgia/arthralgia/back pain, and rash/allergic reactions. Although specific drug interaction studies have not been conducted with ROCKLATAN, in vitro studies have shown that precipitation occurs when eye drops containing thimerosal are mixed with latanoprost ophthalmic solution 0.005%. If such drugs are used, they should be administered at least five (5) minutes apart.The combined use of two or more prostaglandins or prostaglandin analogs including latanoprost ophthalmic solution 0.005% is not recommended. It has been shown that administration of these prostaglandin drug products more than once daily may decrease the IOP lowering effect or cause paradoxical elevations in IOP. Risk SummaryThere are no adequate and well-controlled studies of ROCKLATAN ophthalmic solution or its pharmacologically active ingredients (netarsudil and latanoprost) in pregnant women to inform any drug associated risk. 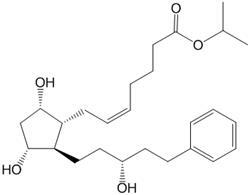 However, systemic exposure to netarsudil from ocular administration is low [see Clinical Pharmacology (12.3)].Reproduction studies of latanoprost showed embryofetal lethality in rabbits. No embryofetal lethality was observed at a dose approximately 15 times higher than the recommended human ophthalmic dose (RHOD). Intravenous administration of netarsudil to pregnant rats and rabbits during organogenesis did not produce adverse embryofetal effects at clinically relevant systemic exposures. ROCKLATAN should be used during pregnancy only if the potential benefit justifies the potential risk to the fetus.DataAnimal DataNetarsudil administered daily by intravenous injection to rats during organogenesis caused abortions and embryofetal lethality at doses ≥0.3 mg/kg/day (126-fold the plasma exposure at the RHOD, based on Cmax). The no-observed-adverse-effect-level (NOAEL) for embryofetal development toxicity was 0.1 mg/kg/day (40-fold the plasma exposure at the RHOD, based on Cmax).Netarsudil administered daily by intravenous injection to rabbits during organogenesis caused embryofetal lethality and decreased fetal weight at 5 mg/kg/day (1480-fold the plasma exposure at the RHOD, based on Cmax). Malformations were observed at ≥3 mg/kg/day (1330-fold the plasma exposure at the RHOD, based on Cmax), including thoracogastroschisis, umbilical hernia and absent intermediate lung lobe. The NOAEL for embryofetal development toxicity was 0.5 mg/kg/day (214-fold the plasma exposure at the RHOD, based on Cmax).Reproduction studies have been performed with latanoprost in rats and rabbits. In 4 of 16 pregnant rabbits, no viable fetuses were present at a dose that was approximately 80 times higher than the RHOD. Latanoprost did not produce embryofetal lethality in rabbits at a dose approximately 15 times higher than the RHOD. Risk SummaryThere are no data on the presence of netarsudil or latanoprost in human milk, the effects on the breastfed infant, or the effects on milk production. However, systemic exposure to netarsudil following topical ocular administration is low, and it is not known whether measurable levels of netarsudil would be present in maternal milk following topical ocular administration. The developmental and health benefits of breastfeeding should be considered along with the mother’s clinical need for ROCKLATAN and any potential adverse effects on the breast-fed child from ROCKLATAN. 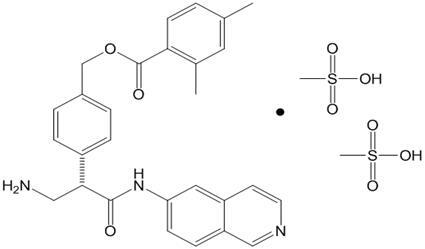 ROCKLATAN (netarsudil and latanoprost ophthalmic solution) 0.02%/0.005% is a fixed dose combination of a Rho kinase inhibitor and a prostaglandin F2α analogue.The chemical name of netarsudil dimesylate is: (S)-4-(3-amino-1-(isoquinolin-6-yl-amino)-1-oxopropan-2-yl)benzyl 2,4-dimethylbenzoate dimesylate. Its molecular formula is C30H35N3O9S2 and its chemical structure is:Netarsudil mesylate is a light yellow to white powder that is freely soluble in water, soluble in methanol, sparingly soluble in dimethyl formamide, and practically insoluble in dichloromethane and heptane.The chemical name of latanoprost is: isopropyl-(Z)-7[1R,2R,3R,5S) 3,5-dihydroxy-2-[(3R)-3-hydroxy-5-phenylpentyl]cyclopentyl]-5-heptenoate. Its molecular formula is C26H40O5 and its chemical structure is: Latanoprost is a colorless to slightly yellow oil that is very soluble in acetonitrile and freely soluble in acetone, ethanol, ethyl acetate, isopropanol, methanol, and octanol. It is practically insoluble in water.ROCKLATAN (netarsudil and latanoprost ophthalmic solution) 0.02%/0.005% is supplied as a sterile, isotonic, buffered aqueous solution of netarsudil mesylate and latanoprost with a pH of approximately 5 and an osmolality of approximately 295 mOsmol/kg. Each mL of ROCKLATAN contains 0.20 mg of netarsudil (equivalent to 0.28 mg of netarsudil dimesylate) and 0.05 mg latanoprost. Benzalkonium chloride, 0.02%, is added as a preservative. The inactive ingredients are: boric acid, mannitol, sodium hydroxide to adjust pH, and water for injection. ROCKLATAN is comprised of two components: netarsudil and latanoprost. Each of these two components decreases elevated IOP. Elevated IOP represents a major risk factor for glaucomatous field loss. The higher the level of IOP, the greater the likelihood of optic nerve damage and glaucomatous visual field loss.ROCKLATAN is believed to reduce IOP by increasing the outflow of aqueous humor. AbsorptionThe systemic exposures of netarsudil and its active metabolite, AR-13503, were evaluated in 18 healthy subjects after topical ocular administration of netarsudil ophthalmic solution 0.02% once daily (1 drop bilaterally in the morning) for 8 days. There were no quantifiable plasma concentrations of netarsudil (lower limit of quantitation (LLOQ) 0.100 ng/mL) post dose on Day 1 and Day 8. Only 1 plasma concentration at 0.11 ng/mL for the active metabolite was observed for 1 subject on Day 8 at 8 hours post-dose.DistributionThe distribution volume in humans is 0.16 ± 0.02 L/kg. Latanoprost is absorbed through the cornea where the isopropyl ester prodrug is hydrolyzed to the acid form to become biologically active. The acid of latanoprost can be measured in aqueous humor during the first 4 hours, and in plasma only during the first hour after local administration. MetabolismAfter topical ocular dosing, netarsudil is metabolized by esterases in the eye to an active metabolite, AR-13503.Latanoprost, an isopropyl ester prodrug, is hydrolyzed by esterases in the cornea to the biologically active acid. The active acid of latanoprost reaching the systemic circulation is primarily metabolized by the liver to the 1,2-dinor and 1,2,3,4-tetranor metabolites via fatty acid β-oxidation.ExcretionThe elimination of the acid of latanoprost from human plasma is rapid (t½ = 17 min) after both intravenous and topical administration. Systemic clearance is approximately 7 mL/min/kg. Following hepatic β-oxidation, the metabolites are mainly eliminated via the kidneys. Approximately 88% and 98% of the administered dose are recovered in the urine after topical and intravenous dosing, respectively. CarcinogenesisLong-term studies in animals have not been performed to evaluate the carcinogenic potential of netarsudil.Latanoprost was not carcinogenic in either mice or rats when administered by oral gavage at doses of up to 170 mcg/kg/day (approximately 2800 times the RHOD) for up to 20 and 24 months, respectively.MutagenesisNetarsudil was not mutagenic in the Ames test, in the mouse lymphoma test, or in the in vivo rat micronucleus test.Latanoprost was not mutagenic in bacteria, in mouse lymphoma, or in mouse micronucleus tests. Chromosome aberrations were observed in vitro with human lymphocytes. Additional in vitro and in vivo studies on unscheduled DNA synthesis in rats were negative.Impairment of FertilityStudies to evaluate the effects of netarsudil on male or female fertility in animals have not been performed.Latanoprost has not been found to have effects on male or female fertility in animal studies. ROCKLATAN (netarsudil and latanoprost ophthalmic solution) 0.02%/0.005% was evaluated in 2 randomized and controlled clinical trials, namely PG324-CS301 (NCT 02558400, referred to as Study 301) and PG324-CS302 (NCT 02674854, referred to as Study 302) in patients with open-angle glaucoma and ocular hypertension. Studies 301 and 302 enrolled subjects with IOP < 36 mmHg and compared IOP lowering effect of ROCKLATAN dosed once daily to individually administered netarsudil 0.02% once daily and latanoprost 0.005% once daily. The treatment duration was 12 months for Study 301 and 3 months for Study 302.The average IOP lowering effect of ROCKLATAN was 1 to 3 mmHg greater than monotherapy with either netarsudil 0.02% or latanoprost 0.005% throughout 3 months (Figures 1 and 2). In Study 301 IOP reductions were maintained throughout 12 months.Figure 1: Study 301 Mean IOP (mmHg) by Treatment Group and Treatment Difference in Mean IOPRocklatan vs.Netarsudil95% CI3.0(2.5, 3.6)3.0(2.4, 3.6)2.4(1.9, 3.0)3.2(2.6, 3.8)2.9(2.3, 3.5)2.3(1.7, 2.8)3.1(2.5, 3.8)3.2(2.5, 3.8)2.0(1.4, 2.6)Rocklatan vs.Latanoprost95% CI2.3(1.7, 2.8)2.6(2.0, 3.2)2.3(1.8, 2.9)1.7(1.1, 2.4)1.9(1.3, 2.5)1.7(1.1, 2.2)1.5(0.9, 2.1)1.7(1.1, 2.3)1.3(0.7, 1.9)The least square mean IOP at each post-baseline time point was derived using an analysis of covariance adjusted for baseline IOP and based on observed data for all randomized subjects (238 in Rocklatan group, 244 in netarsudil group, 236 in latanoprost group).Figure 2: Study 302 Mean IOP (mmHg) by Treatment Group and Treatment Difference in Mean IOPRocklatan vs. Netarsudil95% CI3.4(2.8, 3.9)2.7(2.2, 3.2)2.2(1.7, 2.8)3.2(2.6, 3.8)2.9(2.3, 3.4)2.3(1.8, 2.9)3.6(3.0, 4.2)2.8(2.3, 3.4)2.4(1.9, 2.9)Rocklatan vs. Latanoprost95% CI2.0(1.5, 2.6)2.4(1.9, 2.9)1.9(1.3, 2.4)1.5(0.9, 2.1)1.9(1.3, 2.4)1.6(1.0, 2.1)1.5(0.9, 2.2)2.0(1.4, 2.5)1.5(1.0, 2.1)The least square mean IOP at each post-baseline time point was derived using an analysis of covariance adjusted for baseline IOP and based on observed data for all randomized subjects (245 in Rocklatan group, 255 in netarsudil group, 250 in latanoprost group). 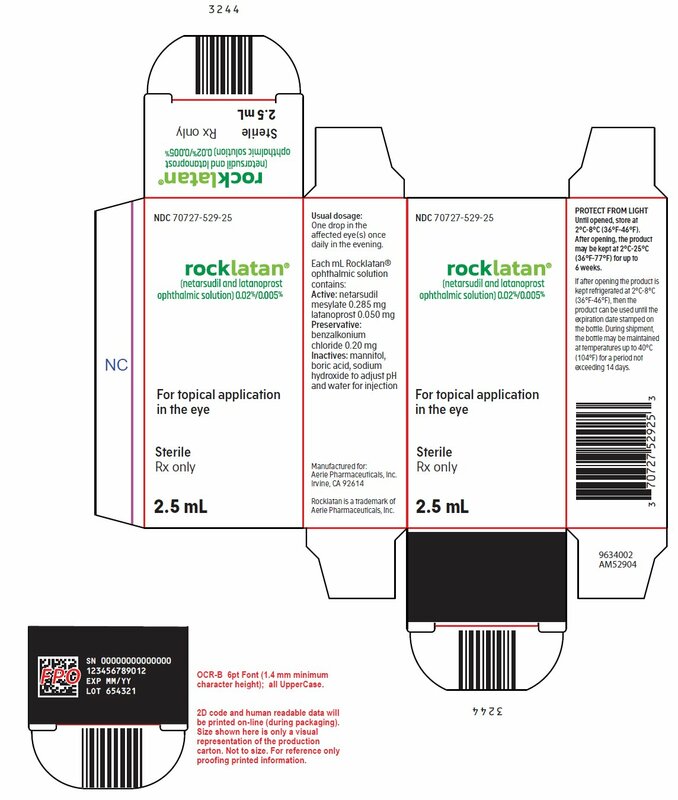 ROCKLATAN (netarsudil and latanoprost ophthalmic solution) 0.02%/0.005% is supplied sterile in clear low density polyethylene bottles with opaque white polyethylene dropper tips and white polypropylene screw caps.2.5 mL fill in a 4 mL container - NDC # 70727-529-25Storage: Protect from light. Store at 2°C to 8°C (36°F to 46°F). During shipment, the bottle may be maintained at temperatures up to 40°C (104°F) for a period not exceeding 14 days. After opening, ROCKLATAN can be used until the expiration date on the bottle. Potential for PigmentationAdvise patients about the potential for increased brown pigmentation of the iris, which may be permanent. Inform patients about the possibility of eyelid skin darkening, which may be reversible after discontinuation of ROCKLATAN [see Warnings and Precautions (5.1)].Potential for Eyelash ChangesInform patients of the possibility of eyelash and vellus hair changes in the treated eye during treatment with ROCKLATAN. These changes may result in a disparity between eyes in length, thickness, pigmentation, number of eyelashes or vellus hairs, and/or direction of eyelash growth. Eyelash changes are usually reversible upon discontinuation of treatment.Handling the ContainerInstruct patients to avoid allowing the tip of the dispensing container to contact the eye, surrounding structures, fingers, or any other surface in order to minimize contamination of the solution. Serious damage to the eye and subsequent loss of vision may result from using contaminated solutions [see Warnings and Precautions (5.6)].When to Seek Physician AdviceAdvise patients that if they develop an intercurrent ocular condition (e.g., trauma or infection), have ocular surgery, or develop any ocular reactions, particularly conjunctivitis and eyelid reactions, they should immediately seek their physician’s advice concerning the continued use of ROCKLATAN.Use with Contact LensesAdvise patients that ROCKLATAN contains benzalkonium chloride, which may be absorbed by soft contact lenses. Contact lenses should be removed prior to instillation of ROCKLATAN and may be reinserted 15 minutes following its administration.Use with Other Ophthalmic DrugsIf more than 1 topical ophthalmic drug is being used, the drugs should be administered at least 5 minutes between applications.Missed DoseAdvise patients that if one dose is missed, treatment should continue with the next dose in the evening.U.S. Patent Nos. : 8,450,344; 8,394,826; 9,096,569; 9,415,043; 9,931,336; 9,993,470ROCKLATAN is a trademark of Aerie Pharmaceuticals, Inc.Manufactured for: Aerie Pharmaceuticals, Inc., Irvine, CA 92614, U.S.A.